This post will cover the Midsummer / Litha ritual and celebration held by the Circle of Fountains. 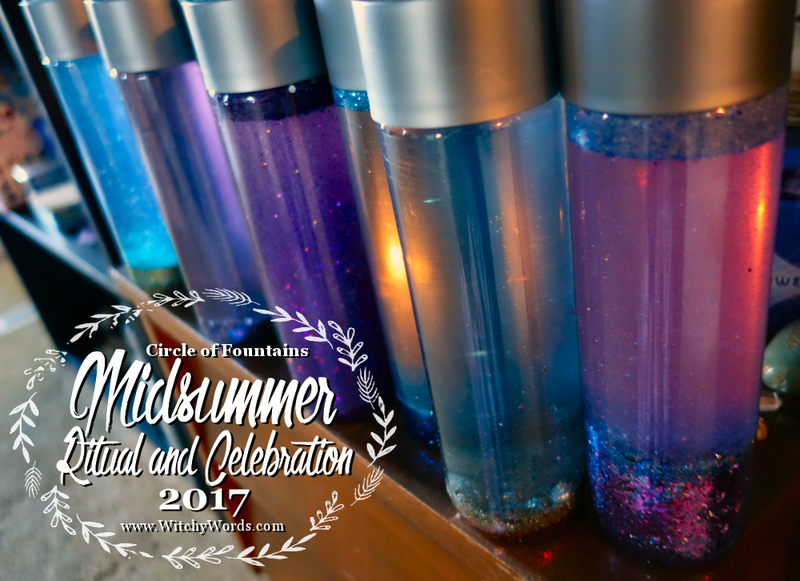 To see the Circle of Fountains 2016 Midsummer ritual, click here! This year's equinox ritual was held by Laura! Laura identifies as a Northern Traditions pagan with both kitchen and cosmic witch tendencies. During her time with Circle of Fountains, she's worked on finding her craft's voice through her rituals. Because of our diverse beliefs and practices, our circle is a fantastic way to find your path and hone skills. This is exactly what Laura has been doing! The evening began with Laura giving us bottles to use to collect solstice rain water. It then followed with a craft! Using simple supplies like Elmer's glue, glitter and warm water, Laura had us create sensory bottles to alleviate stress! They turned out quite well! We then sat down to a Midsummer potluck consisting of pork ribs sous vide, summer succotash, a summer salad and corn on the cob. To drink, Abby made us strawberry margaritas and, for dessert, we had lemon cake and apple cobbler! We then moved to the circle room for ritual. Laura explained that Midsummer is typically a time where all plans are accomplished. As the longest day, it's the longest working day - the day where we work the most towards our goals. It's a day of strength and vitality, of light and empowerment. Because of this, Laura wanted the ritual to become a pause, a moment to catch our breath among the hectic stress of working on the longest day. Borrowing from Mindfulness Exercises, Laura walked us though a guided meditation for reducing anxiety and stress in our lives. Set to Breeze, Laura led us away from the cluttered, overflowing boxes of our stressed minds and towards the expansive universe above to reconnect us with our starlit selves. We climbed the stairs away from the mess and chaos of life to sit in a marble chair, looking up at the night sky. We then lost all sense of physical being, becoming weightless among the stars. She then brought us gently back to the circle and grounded us back to our bodies. Once everyone had grounded back in reality, she bought our attention to the altar. On it sat a large vase. This was our jar of priorities. The jar itself, she said, represents ourselves. The stones represent family, work, school, children, familiars and friends. Passions, enjoyments and activities were the beads that floated down between the stones and filled the space. The sand then represented everything else - all the small things, the daily chaos, the unimportant. Though it seemed as though the jar couldn't be filled any more, Laura added mead - a reminder that there is always time to have a drink with friends. 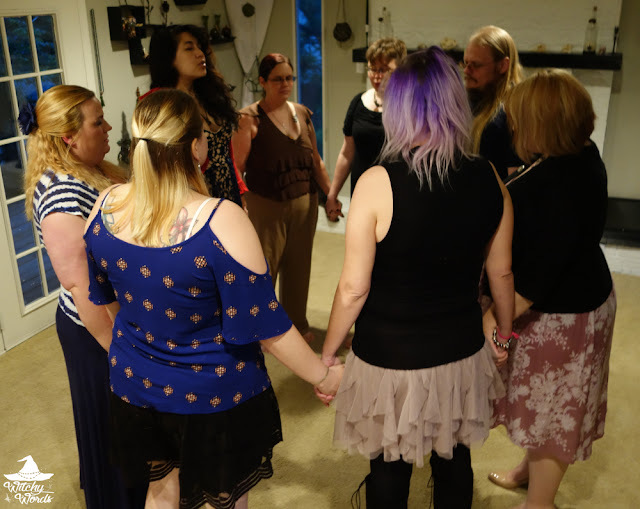 After drinking the mead, Laura asked us to walk counterclockwise and envision the elements being released, closing our circle and ending our ritual. From my circle to yours, we hope you have a wonderful Midsummer! To see the previous Circle of Fountains sabbat ritual, May Day, click here! Let's try this again, I hate auto correct! Lovely ritual. 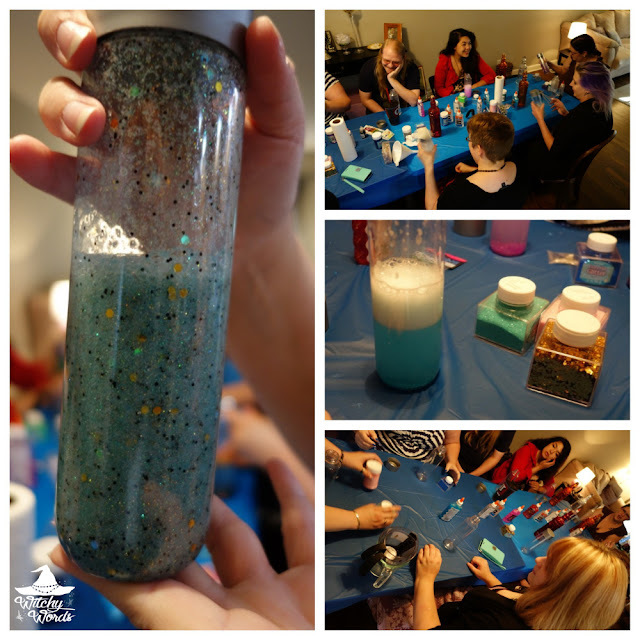 The sensory bottles are gorgeous! You're totally fine. I will pass your kind words along to Laura. Thank you again, Kim!